Of vineyards, forests and rare fruit. This section of the trail passes along the edge of the slope and through tranquil woodland, offering stunning glimpses of the picturesque Old Town in Bernkastel-Kues as far as the idyllic wine-making village of Ürzig . Along the route the village of Zeltingen-Rachtig and the former Cistercian monastery in Machern provide attractive places to stop off and refuel. Just before Zeltingen-Rachtig, you can also visit the experimental orchard and garden in Zeltingen, in which exotic and long-forgotten native vegetables and fruit are grown. 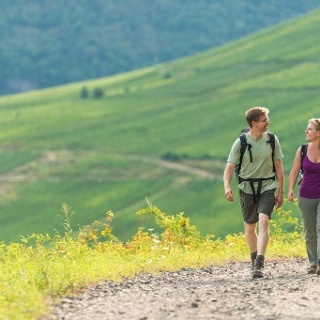 A number of short detours through shaded woodland passages and on grassy paths along the edge of the slope offer variety as well as magnificent views down into the Moselle Valley. The atmosphere in Zeltingen Orchard is particularly lovely in the evening when the autumnal tints of the vineyards bathe the slopes in a golden light. The market place of Bernkastel is a highlight at the beginning of this 11th leg: Timber-framed house typical for the Moselle region, surround the entire square! The access route from the bus station and the Kues city district joins the main trail in direction Ürzig at the market place. The trail leads through the pedestrian zone towards the outskirts of the town. It is hard to imagine that previously a busy highway ran trough these narrow roads. 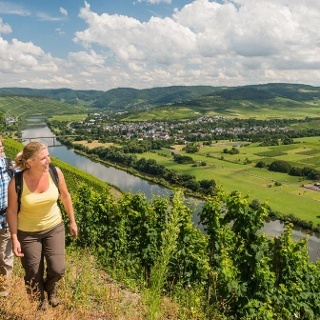 After a few metres in the Kallenfels Valley, the houses are more scattered and give way to a view of the world-famous Doktor vineyard. After you have left the last house behind you, the trail continues steeply uphill - now as path through the forest. The distance to the stream and also the steepness of the path keep changing, and the path continues to climb. You pass a wooden footbridge, then the Moselsteig Trail leaves the course of the stream and continues steeply uphill through a forest of mainly oaks. After a short flat section, it gets quite steep again at the end of the ascent! At the edge of the forest you have finally reached the plateau and a few steps further, you arrive at the Maria Zill viewing point at the slope edge. 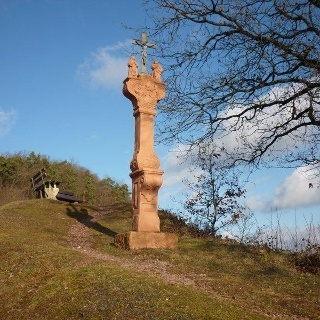 At an altitude of around 400 m above sea level, it is one of the highest and most comprehensive viewing points of the Moselsteig Trail. Bernkastel-Kues lies deep down in the valley and from here, you have a bird’s eye view of the spa clinics on the Kuerser Plateau. The view downstream of the Moselle is also beautiful: Graach, Wehlen and Zeltingen seem just a short distance away. The vista extends to the heights of the Eifel, though several side valleys, right to the Wittlicher Senke. Hiking along the slope edge and the meadow on the plateau, you arrive at the Maria Zill mountain hut. From here, the Moselsteig Trail continues as a path through the lower oak forest. For a short stretch, the path becomes wider, before you cross a depression while hiking on a clearing and finally arrive at the Graacher sheep farm. Using this path you will quickly get to the first houses of the small residential area on the height. An access route branches off here, which takes you to Graach and Wehlen. The trail continues towards Zeltingen through the forest at a steep incline. As soon as it reaches the edge of the forest and therefore the highest point, the Moselsteig Trail already descends again. A meadow surrounded by forest once again offers you a surprising vista towards the heights of the Eifel. The trail remains in the forest and apart from a short intermediate increase, it descends downhill for a long time. You will quickly reach the edge of the forest and the slope edge and therefore also the vineyards. An access route from the Graacher sheep farm joins the Moselsteig Trail. 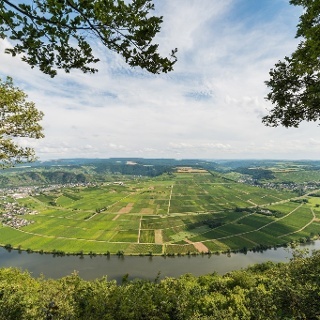 A section along the edge of the forest and the vineyards or vineyard wastelands follows now - the natural paths and the stunning view of the Moselle Valley make this section particularly beautiful. After a swerve through the forest, the tail continues through a holiday house area. The Moselsteig Trail accompanies the slope edge for quite a distance. In between, you have the option of descending to Wehlen via the guided Moselsteig Trail - access route. The Moselsteig Trail continues on the height for a while and you finally arrive at a resting place at the slope edge. Enjoy the views here, they are fantastic! The entire section between Bernkastel and Zeltingen lies at your feet. A little further the Moselsteig Trail continues on a path which leaves the slope edge at the cross in Engelter and thus the slope edge with its glorious views. Over a steep historical path you reach the Zeltingen variety garden. 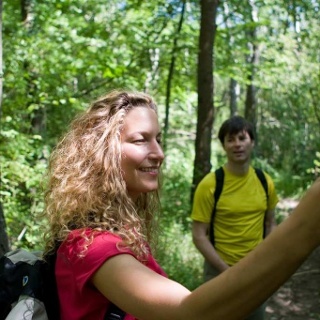 Here, you can admire both native and exotic plants! From the pavilion you have a wonderful view of Zeltingen, the next stop. 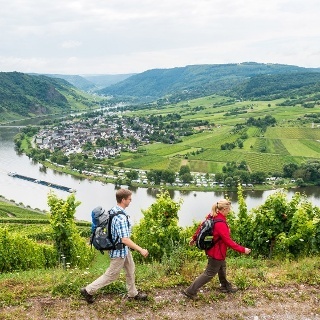 Hiking through the variety garden and over a vineyard path, you reach the outskirts of the town, where a little further on, the access route branches off to the town district of Rachtig. At the bridge head, you will find the path to the close-by bus stop. The Moselsteig Trail continues over the bridge, accompanies the road for a short distance, and reaches the Machern monastery. Behind the monastery, you continue mainly uphill through fallow former vineyards. Half-way, the path maintains its height for quite a distance, before it climbs even higher, in parts, on a narrow pass. Then the Moselsteig Trail branches off from the narrow pass and continues in parallel to the slope. Soon you will cross the construction site of the High Moselle transition, and a short distance below the bridge abutment on the Eifel-side, the Moselsteig Trail passes under the gigantic construction project. Behind the construction site, the trail reaches the edge of the forest. Take another look back: You get an excellent view of the section you have travelled so far! In the forest, you continue to a water container. And from here, steeply downhill into a ravine and over a footbridge and stairways. The last section to Ürzig once again climbs steeply on a narrow pass. Close to the last serpentine of the L 56 you will arrive at the destination of this leg, in Ürzig. 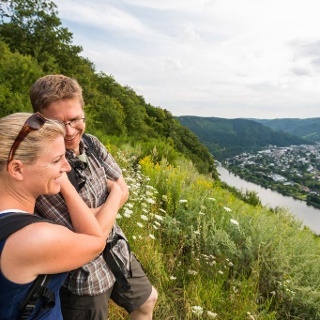 A steep access route with a few steps takes you to the lower part of Ürzig, where you will also find the bus stop at the banks of the Moselle. The hiking guides and the maps are available in bookstores or on the website www.moselsteig.de under the heading "Brochures & information material". Ganz tolle sowie aussichtsreiche Tour an einem herrlich warmen Februartag mit morgentlichem Nebel über der Mosel,welcher sich aber sehr schnell auflöste und die Sicht auf das herrliche Moseltal freigab.Ich parkte an der Burg Landhut(kostenlose Plätze) und hatte somit direkt schon herrliche Tiefblicke auf Bernkastel- Kues. So war es mit rund 20 Kilometer und etwa 1000 Höhenmeter eine recht sportliche Angelegenheit.Ein ganz großer Minuspunkt ist die sehr schlechte,bis nicht vorhandene Infrastruktur für den Rückweg.Ich stand also am Sonntagabend im pittoresken Ürzig und wollte zurück nach BKS. Kein Bus am Wochenende,Bahn nicht vorhanden,und die von mir erhofften Passagierschiffe waren im Februar nicht im Einsatz! So blieb mir letztlich nur das Taxi für stolze 28 Euro....aber:Die schöne Tour war´s wirklich wert! Schweißtreibender Aufstieg zu Maria Zill ;) sehr schöne abwechslungsreiche, aussichtsreiche Etappe in die wunderschöne Altstadt von Bernkastel.